The fertile Valencian land has made this part of Spain rich in its cuisine. Most dishes explained have been developed through the old peasant recipes. Valencia is the originator of one of the most disputed dishes in the land, paella. 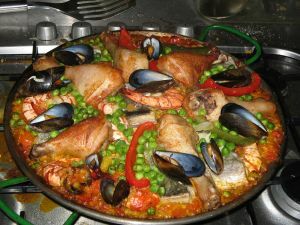 Valencian paella is made in one gigantic pan; using rice, green beans, rabbit, chicken and sometimes seafood. It is spiced with saffron, sweet paprika and fresh rosemary. Flideau is a dish that can be found on many menus, often near the paella section. It is from the region, La Safor and is made in a similar way to paella apart from that it contains noodles instead of rice. Arroz banda developed among the regions fishermen. Rice and fish are cooked individually, so that two flavours can be enjoyed and normally it is served simply with garlic and oil. You may also come across many stews referred to as, ollas, olletas, putxeros and tarongetes. Dishes such as olla churra aremade from cuts of pork, black pudding, and oats. Also another stew is olla de recapte, a dish containing, vegetables, legumes, variety of meats and dried beef. These are just some examples of a variety of stews made in this region. Valencia definitely has a sweet tooth due to its development of an array of sweet products. For example in the bakery sector you can find: doughnuts, turnovers, coconut cakes, anisette rolls etc. Then there is the sweet but healthier option of horchatta. A refreshing summer drink made from tiger nuts.